U.S. Supreme Court justices dissected UT-Austin's unusual admissions procedures on Wednesday, questioning whether Texas' flagship campus should keep using race as a factor when evaluating some of its applicants. WASHINGTON, D.C. — U.S. Supreme Court justices dissected and debated the University of Texas at Austin's unusual admissions procedures on Wednesday, questioning whether Texas' flagship campus should keep using race as a factor when evaluating some of its applicants. They asked whether UT-Austin is unfairly stereotyping minority students who are automatically admitted to the university under its "top 10 percent" rule, a state law that guarantees admission to students who graduate near the top of their public high school class. They wondered aloud when affirmative action would no longer be needed at the nation's colleges. And one justice considered a likely swing vote — Anthony Kennedy — repeatedly questioned whether the high court should send the case against UT back to a lower court. The court's decision in Fisher v. the University of Texas at Austin, expected sometime next year, could have a transformative effect on how students get into college, in Texas and across the country. Some fear it could end affirmative action — the practice of giving minorities, especially Hispanics and blacks, a modest boost in admissions — altogether. But aside from a few questions and comments, the discussion during Wednesday's hourlong oral arguments focused narrowly on how UT-Austin considers race. And several justices appeared skeptical of the university’s procedures. The university admits 75 percent of its incoming freshmen based on the top 10 percent rule, the idea being that Texas public schools are segregated, so accepting students from all over will create a more diverse class. The law applies to all Texas universities, but UT-Austin has a slight exception. It gets so many applicants that it is only required to accept students in the top 7 percent of their graduating classes. Race is not a factor in the top 10 percent rule, and the law's legality is not a matter of debate. On Wednesday, justices instead honed in on how the remaining 25 percent of UT-Austin students are admitted: through a "holistic review process" that takes race, SAT scores, extracurricular activities and other factors into account. 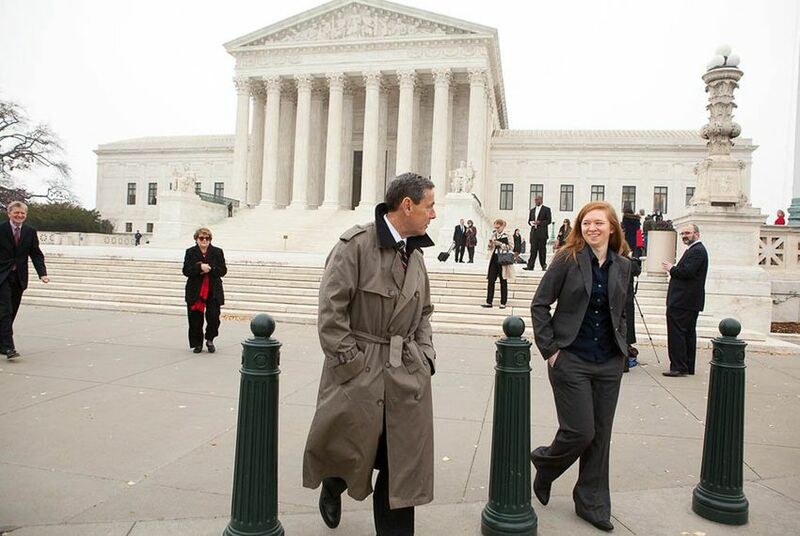 The case under the high court's review was filed by Abigail Fisher, a white Sugar Land native who was rejected from UT-Austin in 2008. She sued the university, saying she was treated unfairly in the application process because she is white. The Supreme Court originally heard her case in 2012 but didn't rule on the specifics of her complaint. Instead, justices sent the case back to a lower court. They reiterated that universities must have a compelling reason to use affirmative action and show that no "race-neutral" alternatives to it suffice. The lower court Fisher's case was sent back to once again ruled in UT-Austin's favor, and the Supreme Court is reviewing Fisher's appeal. Fisher's lawyers have argued that the top 10 percent rule is a sufficient, race-neutral alternative to affirmative action and that race shouldn't be considered for those remaining UT-Austin applicants. On Wednesday, some conservative justices seemed to agree. Justice Samuel Alito said he had a hard time understanding why the diversity UT-Austin obtained through the top 10 percent rule wasn't enough. UT-Austin has argued it must be able to attract minorities with varying backgrounds, special challenges and unique skills, not just those who graduate in the top 10 percent of their class. Alito said he is suspicious of any argument that UT-Austin can't find those students in the automatically admitted pool. "I don't know what the basis for that is," he said. "Really, it is on the basis of terrible stereotyping." Other conservatives on the court raised questions about affirmative action in general. Chief Justice John Roberts wondered how universities will ever know that they are diverse enough to stop using racial preferences. And Justice Antonin Scalia cited a brief in the case that argued that sending black and Hispanic students to schools they aren't prepared for doesn't do them any good. Scalia said most of the black scientists in America "do not come from the most advanced schools." "There are those who contend that it does not benefit African-Americans to get them into the University of Texas where they do not do well, as opposed to having them go to a less advanced school, a slower track school where they do well," Scalia said. The liberal justices questioned the focus on the top 10 percent rule as a race-neutral solution. Justice Ruth Bader Ginsburg noted that the top 10 percent rule was designed to increase diversity at Texas universities and that it may be "disingenuous" to suggest that it's race-neutral. Meanwhile, Justice Sonia Sotomayor raised questions about whether UT-Austin's consideration of race was all that unique. She asked whether, after setting aside the automatically admitted students, UT-Austin was simply following the same affirmative action process used at universities across the country. If that's the case, then a ruling against UT-Austin might eliminate affirmative action everywhere, she said. "Won't every school have to use a 10 percent plan?" she asked. Kennedy, whose vote often tips rulings in one direction or another, offered few hints about which way he might be leaning. He instead asked repeated questions about whether the justices had enough information to make a ruling. Not much new has been presented since the last time the Supreme Court heard the case, he added. "We are just re-litigating the same case," said Kennedy, who authored the majority opinion in the 7-1 ruling that sent the case back to the lower court in 2013. Civil rights leaders had mixed reactions. Sherrilyn Ifill, president of the NAACP Legal Defense Fund, said she heard compelling arguments in favor of UT-Austin. But civil rights activist and talk show host Al Sharpton said he felt "very concerned." "Today could be a devastating blow to those that are fighting for racial fairness on campus," he said.